On Friday, 23rd of November 2018, a delegation from Burgenland visited the IRE: District Commissioner from Jennersdorf, Hermann Prem, Prof. Robert Hajszan and his wife. The successful work of the Pannonian Institute (PAIN) based in Güttenbach (Burgenland) was discussed. For over 25 years, a yearbook in 5 languages – German – Slovenian – Hungarian – Burgenland Croatian and Croatian has been created. The Pannonian Institute deals with current topics in the field of transnational cultural exchange, language maintenance, political developments, know-how transfer and many others. Founder and Chairman of the Pannonian Institute, Dr. Ing. Hajszan presented IRE Chairman and former governor Univ. Prof. Dr. Franz Schausberger, the total expenditure of all 25 yearbooks from 1994 to 2018. 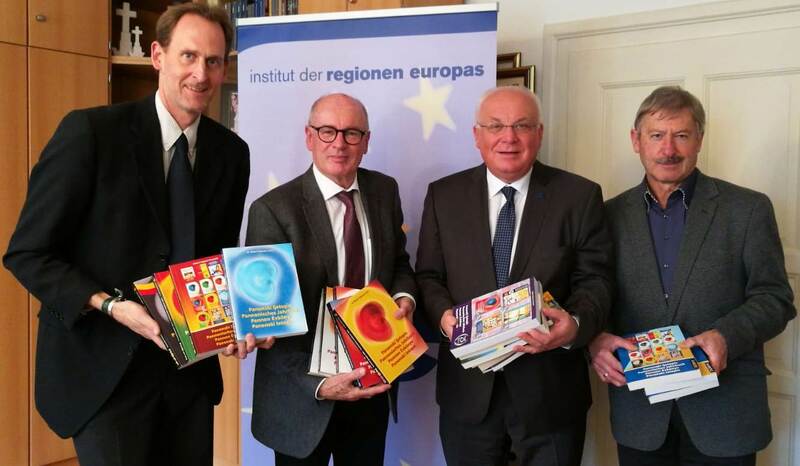 For the future possibilities of a joint cooperation between the Pannonian Institute and the Institute of the Regions of Europe (IRE) were discussed. The countries Slovenia, Croatia and Hungary are also priority countries for the IRE and many regional and local partners as well as science partners are part of the current network.